In Missionary Max and the Jungle Princess, there is a scene where our hero finds himself swinging a beautiful woman around the ballroom floor at a high-society ball. A few pages later he is in the middle of the jungle participating yearly celebration among the Yamani natives. While there are many aspects of the Missionary Max adventures that are flights of fancy, this stark and rapid contrast in surroundings is part and parcel of our work here – minus the evil villains scheming our demise…I think. You often see pictures of us hacking our way through the underbrush at camp, or traveling over rugged roads, or engaged in heavy work of one sort of the other. But living in São Luís also provides us with many opportunities to enjoy high culture. Such was the case on Tuesday, as Michael, Pastor Francivaldo and myself attended a concert of the Orquestra Jovem Maranhense João do Vale, in the venerable Artur Azevedo Theater. This being a cultural event in a high class venue, Michael and I spiffed up a little. By the way, if you click on the arrow in the above picture, you will get an idea of how tall he is. We arrived early enough to get really good seats. While we waited I tried to get some good pictures of the theater, but the only one that was really Instagram-worthy was this shot of the chandelier, which was directly above us. A selection from Bizet’s Carmen. BARÍTONO: Henrique Lisboa/ Solista. Trecho de: Escamilo- Carmen Suíte ||. SOPRANO SPINTO: Rose Nogueira/Solista. Trecho de:Carmen Suíte ||/ Habanera. And a selection from a Brazilian composer. Soprano:Lívia Berredo/convidada. Trecho de:Serenata Brasileira. After the concert I got to meet the director, the very talented (and hilarious) Edson Cosmos. I also got to hobnob with three friends of mine who are part of the orchestra and choir. Afterward we were scheduled to go out for pizza with Nilton, pictured above on the right, who is the pianist for the orchestra. Imagine my surprise when he walked in with about half the orchestra. I was delighted to be able to talk with several members of the group. They were interested in hearing about musical traditions in the US, and about our recorder orchestra at Ebenezer. As a result, I am currently working on a plan to take the recorder orchestra to their next concert. Cultural activities like this are not as common as they might be in the US, and our schedule does not always allow us to participate when they do appear. But when event and schedule arise, we thoroughly enjoy them. 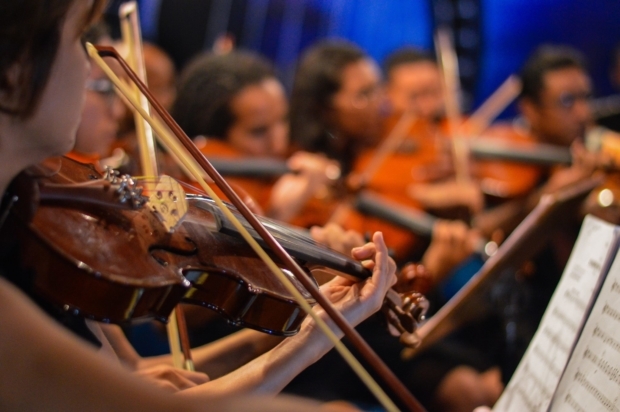 **Banner photo is from the Facebook page of the Orquestra Jovem Maranhense João do Vale. The links below – and some within the text – are affiliate links. That means that clicking and making purchases is one way you can help our work.